You are an underwater real estate developer contracted to build or improve underwater developments for eight thriving fish communities. Discover and develop unique underwater communities in Aquapolis. In each community you will be introduced to a new Steward who will require you to build new buildings with new building-related activities. Be the owner of a real-estate empire, a thriving business community, or the infrastructural requirements for each development. Keep you eye on the communities' level of cleanliness as well, ensuring that the inhabitants have clean water to breath by balancing industrial developments with beautiful gardens that filter dirty water. 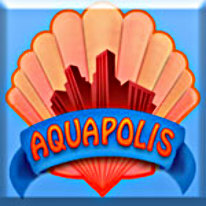 Explore the ocean as never before, build your Aquapolis!